Part 1 – Overview: How does Canvas get data into Data Studio? Whether you want a 15-minute overview, a demo, a 30-minute training session, or a call to review your reporting challenges, we’re happy to connect via web-conference. Part 1 – How does Canvas get data into Data Studio? Analytics Canvas is designed to pull data from various sources, mix, manage, and clean data, all in a graphical environment that makes it easy to create and refresh data workflows without writing code. It is desktop software installed on any Windows machine and connects to various data sources, both online and offline. If you’re new to Analytics Canvas, or so called “ETL” (Extract, Transform, Load) software, check out our quick-start guide. Using the desktop application, select one or more tables to access in a Data Studio report. Next, use the Data Studio export feature to publish data to the Analytics Canvas Cloud where it can be accessed while creating or viewing reports in Data Studio. To get your data into Data Studio using Analytics Canvas, install Analytics Canvas on any Windows machine. If you do not already have a license, sign-up to instantly get a trial key – you’ll be installed and in the app within minutes. From the Data Sources section, select one or more data sets you’d like to see in Data Studio. Perform any data cleansing and preparation tasks, like stripping parameters from URLs, combining data sets together, or filtering on specific date ranges. Finally, connect a Google Data Studio export block. Once you have added users and configured the export, run the Canvas to publish your dataset to the Analytics Canvas Cloud service and have it instantly available in Google Data Studio. Now that your data is published, head on over to Data Studio in your browser and from a new or existing report, select “Create New Data Source”. 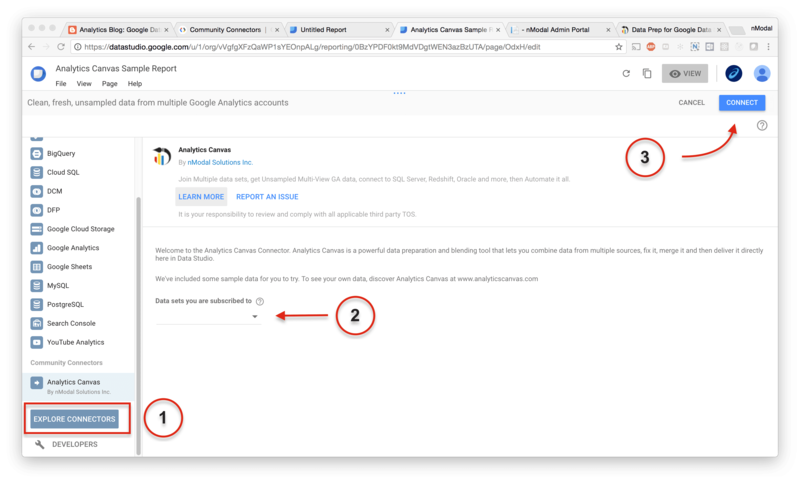 2) Authorize the Analytics Canvas Data Studio connector, allowing it to bring your data into Data Studio. That’s it! The data source is now connected and works just like any other data source in Data Studio. Who can access my datasets? Only you and those users that you explicitly provide access to when creating or updating the dataset. Your datasets are stored in the Analytics Canvas Cloud. If you have specific requirements, contact us to discuss your needs. Do I need a Canvas user license for everyone who access my datasets? No. Only those who are using the software to create and publish datasets require a license to Analytics Canvas. Which plans do I need to get this connector? The Data Studio export feature is currently in beta. We will clarify plans and pricing when the connector is fully released. Of course. If you would like help or guidance on getting going with Analytics Canvas or need us to create templates, we can provide professional services to meet your strategic or tactical needs. Contact us. Extract, Transform, Load. ETL is a category of business intelligence software. It generally involves moving data from one point to another, often ‘transforming’ the data in-between by performing calculations, aggregations, joins, and other forms of data processing, before ‘loading’ it into another data store, such as a spreadsheet, file, or another database table. Kind of like a database table, only smarter. An Analytics Canvas dataset is an output of data that is written to the Analytics Canvas Cloud. It is versioned, can be aggregated, and is highly compressed so that it can quickly travel from our cloud to your BI or data visualization tool. Our data centre where customers can store and access data and run data tasks.